50 Shades; Yes, I read it. Yes, I'm reviewing it. As a parent, I enjoy reading stories from other parents about what it is like to naviagte the world of parenting. I tend to lean more towards the serious, heartwarming type rather than the " I need a drink before noon" type simply because I prefer the honesty over humor. Don't get me wrong, I OFTEN joke and kid about how I could easily start drinking at 7am on any given day but in reality, that doesn't help me get through the day. I like to know the ins and outs, the struggles, the reflections, the joys and the concerns of real every day parenting. This book had that for me. Gilman was raised in a very smart, percocious, literary world and grew to be a lover of the written word, most notably romantic poetry. She was looking forward to sharing this love with her own children and creating that idyllic childhood world she had. But her first born son is diagnosed with the developmental disorder, Hyperlexia and she is faced with the challenges of supporting his needs. Hyperlexia was initially identified by Silberg and Silberg (1967), who defined it as the precocious ability to read words without prior training in learning to read typically before the age of 5. They indicated that children with hyperlexia have a significantly higher word decoding ability than their reading comprehension levels. As a lover of language and books, Gilman found it hard to recognize a problem with her son because he exhibited such "smart" tendencies. As time went on, however, other issues came to light and she made those tough decisions to get as much help as she could to make him as successful as he could be. I loved everything about this book. I loved the relationship between mother and son. I loved the son and everything he could do and how he communicated. As a mother of a son who has some "needs" that could be considered special, I found the whole story heartwarming. Yes, it's hard. Yes, it was a struggle at times to figure out the best course of action. Yes, it put a strain on the marriage. But overall, any parent goes through ups and downs and reading stories like this that display a family that may have a few more struggles, makes you learn and hope for the best for them and for your own family. Nobody has it easy. All you can do is love the child and the family you have and support them and advocate for them as long as you breathe! Gilman did just that and I applaud her for that. And what a strong bond she has with her son. Amazing! Parents, especially should read this, whether you have children with special needs or not. It is a testament of the true love between parent and child. I think it would appeal to folks who are parents more than those who are not but it is a wonderfully written book overall, with many quotes of romantic poetry as well. Thanks to TLC Book Tours for having me on this tour. Click on the link for the other stops. I'm so glad you liked it! 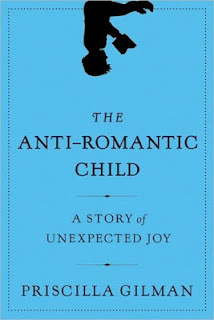 Books like this are so much more powerful for me now, as I love the mother child bond and the journey of motherhood. I'm curious what are the other signs besides reading?